Last weekend, I got the spend the better part of two days throwing down with complete strangers at Warzone Atlanta. An analysis of the tournament itself is coming when I get a chance to plow into the data, but in the meantime, how was it as an event? The Venue: Warzone Atlanta (hereby WZA) was held this year (and apparently last) at a Hilton Doubletree hotel. I’ve stayed in my fair share of them, and the host hotel was a good one – at a decent price. The hotel was reasonably accommodating (though they’ve gotten wise to Paul Murphy’s ‘Room Service Tray as Display Tray’ plan), the lobby is more condusive to sitting around and chatting with your fellow gamers than many I’ve been in (and after Day 1 I did exactly that, and had a blast chatting with some guys from Alabama). The Food: One of the other major selling points of WZA is that lunch is included. At some other events you’re either left to your own devices, or facing down overpriced and middling-quality fare. The hotel restaurant is actively good (I also had dinner there one night with some other folks), and lunch was delicious, and there was usually enough variation that you could make a passable meal even if you didn’t like one of the options, unless you had some pretty strict dietary preferences. It was also nice to have a place to sit and eat as well as chat with your fellow gamers, rather than either breaking up into small groups, or having to perch plates on gaming tables and hope nothing spills. The Tables: One of the things that separates, in my mind, 40K from a lot of comparable games, not to mention board games, hex-and-counter games, etc. is vibrant, well designed tables and terrain. 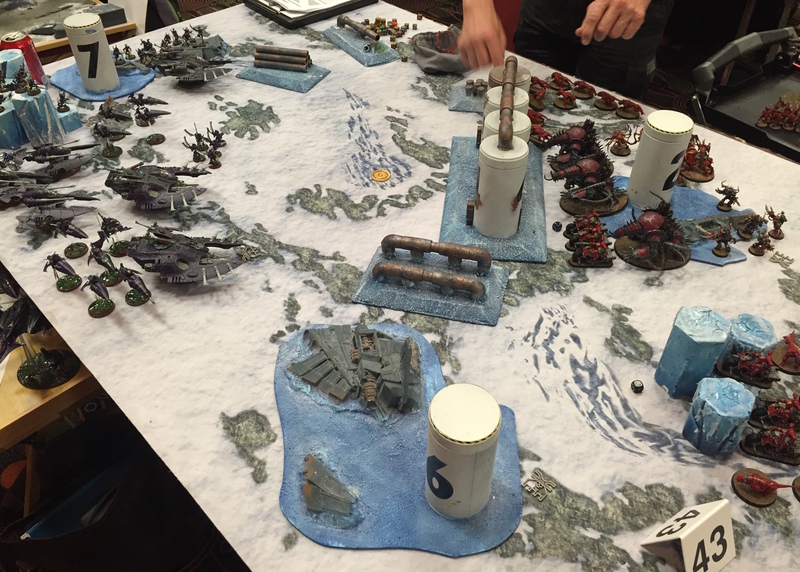 Those were there in abundance – good, themed terrain, plenty of it LOS blocking, complemented with game mats. The Armies: Credit where credit is due, Warzone Atlanta was full of some very nicely painted armies. I’ve been to some tournaments where there’s a substantial proportion of the armies that are barely at the three color minimum. Not so with WZA. Nearly everyone was there with what I’d at least call a decent tabletop standard, and there were some genuinely beautiful armies there. WZA also appears to be where the display boards come out to play. I’ve never seen such a high proportion of armies with themed boards – and some of them are genuinely off the hook. The Mission Packet: The WZA mission packet is one of the best I’ve played with. There were definitely missions that favor Deathstars, and others that favor MSU. Some where mobility felt like a huge advantage, and some where it was middling handy at both. Additionally, the secondary objectives felt genuinely different. In most ITC events, I find the secondary objective mostly serves to add injury to insult in terms of the score (see analysis here). In contrast, several times I found myself thinking “Well, perhaps it’s time to go for the secondary”, or fighting for that tooth and nail to pull out a win. If I had to run a tournament, this is the pack I would run it with. The Games Themselves: I had five games against genuinely great opponents. 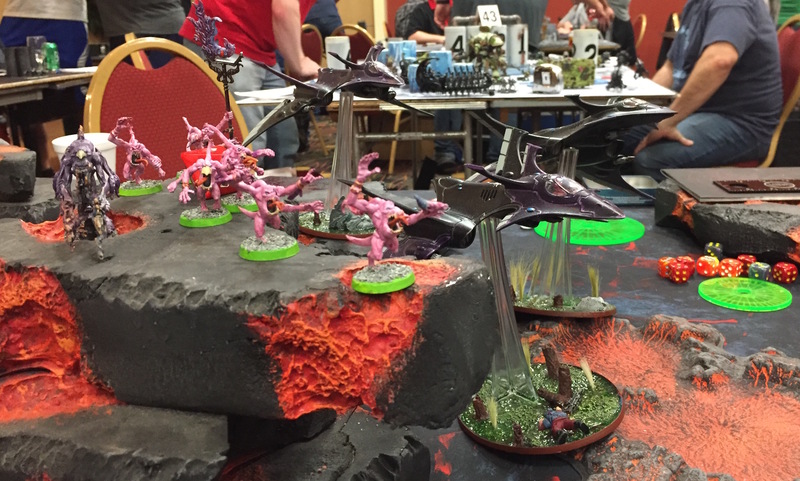 I confess I didn’t really come with a “tournament ready” army – my Eldar are designed to hang out at the middle tables of an RTT, which means at an event like WZA, where people are coming with an eye toward winning, it doesn’t really have much of a shot at the top tables. That meant for a rough first game, matched up randomly to an army featuring a Ta’Unar Supremacy suit, two of the Y’Vahra battle suits, and a smattering of other Tau heavy hitters. This went about the way you’d expect it to. I headed to the lower tables, and my opponent headed up – as far as I know, he had a pretty decent showing. Despite getting my teeth kicked in, it was a fun game, seeing some units I’ve never seen before, and the guy who did the kicking was a lot of fun to play against. Once it became obvious that this wasn’t really a contest, we both started playing for novelty objectives (Tau in close combat!). Having been exiled to the proper end of the hallway, the fun, hard-fought match-ups began. First up: the Eldar’s oldest enemies, the Necrons plus a novelty “Don’t Seize on Me” Coteaz. I promptly Seized the Initiative. What followed was an…illuminating turn of Eldar shooting before the grinding march of the Necrons began. My opponent was playing an army similar to my own – fun, with some strong formations, but not a tournament build. But he was a good sport, and it was a great time, both of us holding on to some things by the skin of our teeth (indeed, both Coteaz and my Autarch ended up hiding in buildings). The best games of 40K are the ones where you have no idea who won at the end, and this was one of those. The final count game down to me rolling a 4+ to randomly allocate a unit to the right table quarter to claim the secondary objective, but it was a very near thing with a great opponent. And that was the end of Day 1. Delicious dinner was had with some very good company (including Paul Murphy of Forge the Narrative fame), bullshitting took place in the lobby (where it was determined that Maelstrom is the One True Way to play 40K), and then I passed the hell out, having gotten five hours of sleep the night before. 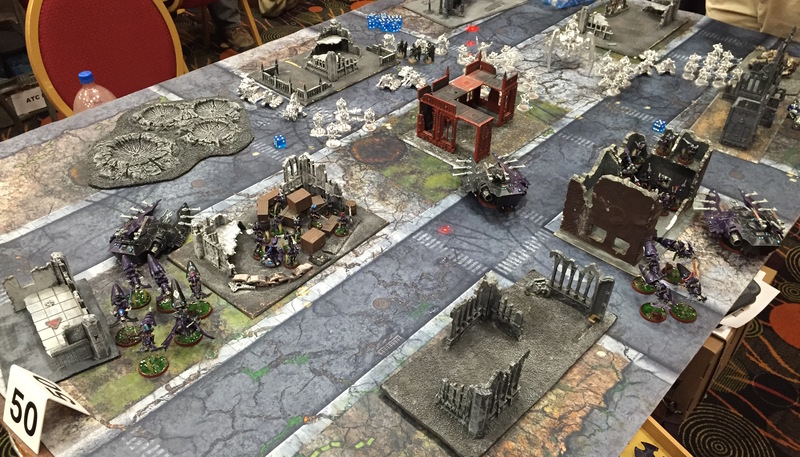 Day 2 began with a matchup against a guy who I had met previously, a British ex-pat running a Khorne Daemonkin army. I was a little nervous, as I’ve never had the chance to match up against the KDK, and we were playing a progressive objectives + the Relic mission, which plays well to the strengths of a fast, aggressive army. I ended up deploying very conservatively, laying down a fire base to basically obliterate anything that poked its head out from some substantial LOS blocking terrain, but struggling to contest any objectives in the middle half of the board, in one case feeding a unit of dogs, and then a unit of Blood Letters a Guardian Squad and their Wave Serpent to keep one of them contested. His Heldrakes did what they normally do any just obliterated something on the turn they came in, but promptly discovered just how good the Crimson Death formation is at maintaining air superiority. Close and bloody, the game ended with a last turn KDK gambit to seize the relic, which would have won him the game. Instead, I managed to wipe out the unit that was holding it, his Lord and some spawn, leaving it sitting idle in the middle of the board and scraping out another hard fought, genuinely fun win against a great guy. This is where I also once more establish my trend for games: If my Hornets are left unmolested to do their thing, I win. If not, and they get killed or locked down and forced to Jink, I lose. For Game Five, I ran into the ceiling of my and my army’s ability, and someone who knew that trend above. I was looking forward to this matchup – a Tzeentchy psyker heavy Daemon army with Fate Weaver, a Changer of Ways, and three Soul Grinders. Played on a pretty terrain heavy table with lots of LOS blocking (and a great thematic feel for playing a Daemon army) it was always going to be a close battle. Failing to get the first turn, despite the 5+ Seize Warlord Trait set things on a worrisome level. Hornets jinking the first turn, Fateweaver D-ing out a Wave Serpent with Prismatic Beam…things got off to an ugly start. Things ended up being hard fought – Fateweaver cowering behind terrain after seeing what three Crimson Hunters did to his Changer buddy, some demons ground down, but the end the Eldar just couldn’t put out enough firepower, cornered and snap-shooting. Was a great game though – I can’t begrudge losing to a fun opponent who genuinely had me outplayed. Closing Thoughts: Warzone Atlanta was a blast. The best party in 40K? Don’t know that I have a representative sample for that. But it was a damned good party with some 40K. And full credit to the sponsors and hosts, the prize support was amazing. Something like 20% of the total player base walked away with a prize, and the Bounty System is a master-stroke. I wasn’t a contender for anything but it still felt awesome when a whole room cheered when I claimed the bounty for seizing on Coteaz. And I cheered with everyone else when the first T’aunar went down. It’s a great way to add a little flair and have people bring back something cool from an event, as well as to promote and foster a feeling of community over several years with references to past victories and defeats. Possibly the most controversial aspect of WZA is that they play something pretty damned close to straight 7th Edition 40K. The requirements? Only one Superheavy or similar (or Knight Formation), and Battle Forged. 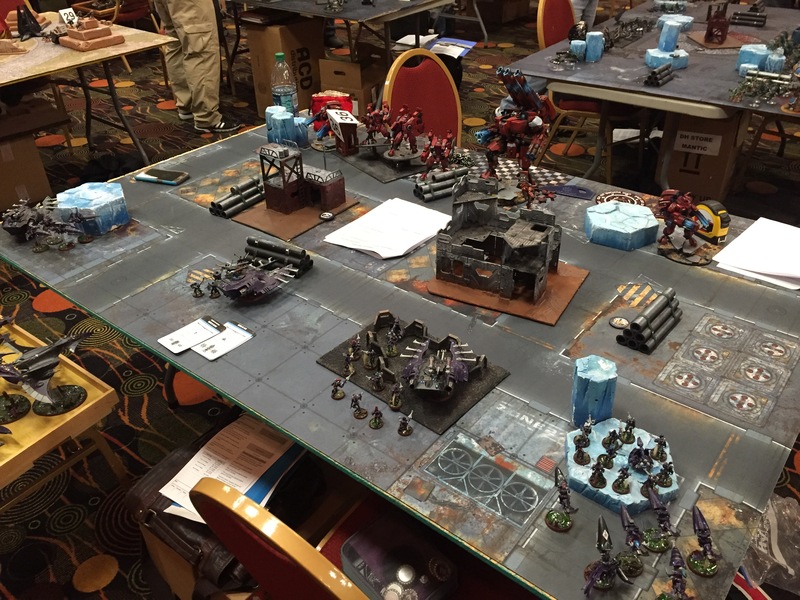 That’s a pretty lax comp system, and it was embraced whole-heartedly, with a number of armies mixing large number of factions, people rocking Come the Apocalypse allies, and Superheavy units normally not seen at ITC tournaments. Most notably the T’aunar, aka the Super Tuna. Having now faced one, it’s an amazingly effective unit – relatively inexpensive for what it does, and unlike many of the Tau units, not dependent on building up synergy with other units to be effective. The Tuna is perfectly effective alone, and that makes it extremely powerful. Powerful enough that there were a large number of them at the tournament – but not powerful enough to carry the tournament. But their presence, and what I expect will be an above-average performance by the Tau compared to other tournaments underscores a point: composition rules don’t balance the meta, they alter it, adding or taking away niches for particular armies. A freeform meta like WZA favors armies currently blessed with an efficient superheavy and Forge World’s slow development time. 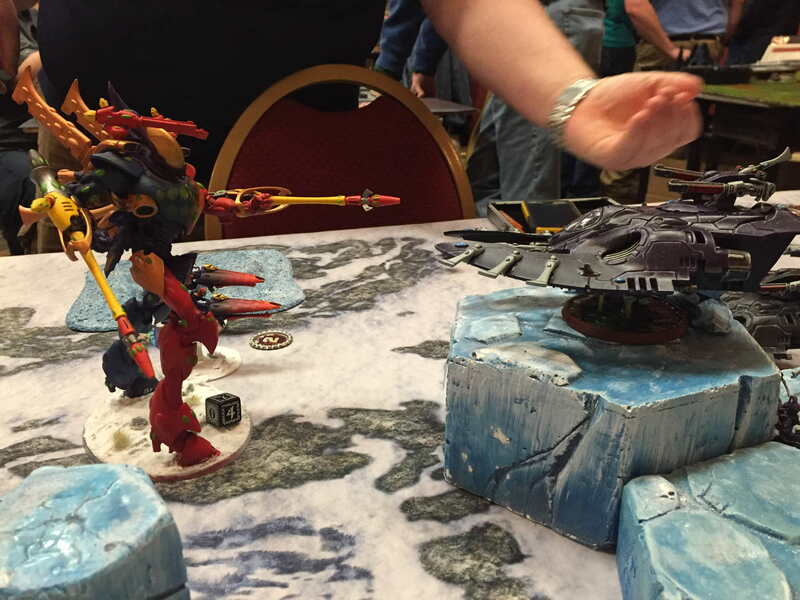 A “Single Codex, CAD Only” tournament is a love-note to Scatterbike Eldar. I’ve said this before, but WZA brought this into particularly stark relief. Overall? An excellent time with some excellent folks. Just wish it wasn’t literally on the other side of the country.